This article about GoodBelly Probiotics contains affiliate links. 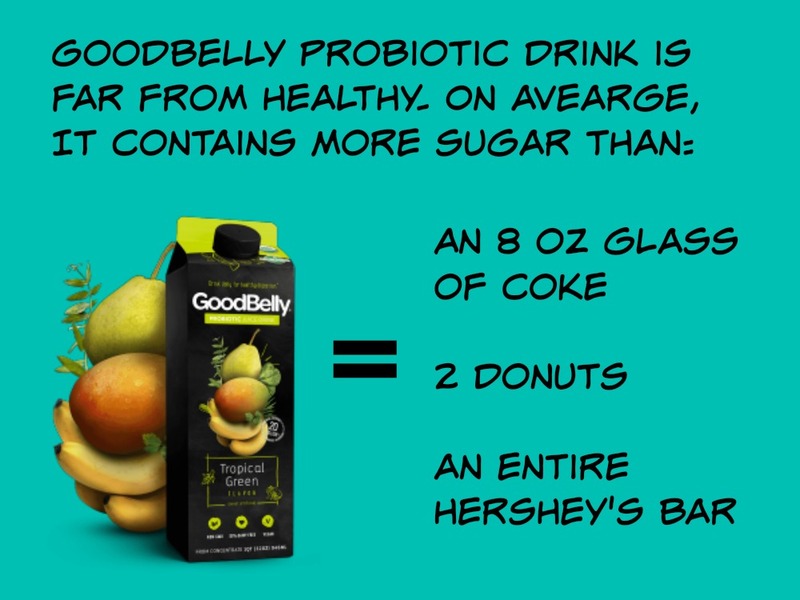 News Flash: There is sugar in GoodBelly Probiotic beverages. In fact, these probiotic drinks are loaded with gut-inflaming sugar. I took one look at the nutrition label of GoodBelly Probiotics and got sick thinking about it. People are drinking this stuff thinking it’s a health food, but indeed it is not! Yet, the drinks are is being marketed as a health food. Let me assure you, though, this drink is far from healthy! There is a lot of sugar in Goodbelly probiotics. First a little nutrition lesson. The reason someone might need a probiotic is because their belly is rumbling. They may have yeast in their belly (click here to learn more about candida), or upset stomach (gassy, bloating, etc…. you get the picture.). A good probiotic repopulates your gut with good bacteria, helping you restore the bacteria balance in your gut. However, did you know that the yeast in your body (aka, bad bacteria) actually FEEDS on sugar? Yes, my dear, sugar makes your bad bacteria worse. It makes you feel more gassy, bloated, constipated, etc. Sugar is just fanning the flames of yeast and indigestion! So someone tell me, why in the world would you drink GoodBelly probiotic drinks to feel better if they are loaded with SUGAR?!? Sure, the sugars are “natural sugars from fruit juices,” and GoodBelly says on its website the sugar is important to “keeping the probiotics stable”, but it’s still sugar people and that is bad news for your gut and your overall health! Here’s more about the role of sugar in Goodbelly drinks (I took this screenshot from the Goodbelly website). Guess how much sugar the government recommends in your diet? The answer is very little, if any. Guess what bad bacteria in your gut is feeding off of? Sugar. It doesn’t discriminate whether it’s fruit juice or the white refined stuff. Sugar is sugar to yeast and bad bacteria. Guess what is making you fat and crave more sugar? Yep, it’s sugar. Let’s compare Tropical Orange GoodBelly (26 grams of sugar per 8 oz.) to a glass of Coke (24 grams of sugar per 8 oz.). Oh no, don’t say so! Your GoodBelly drink has more sugar than a can of Coke! Let’s compare Blueberry Acai GoodBelly (24 grams of sugar per 8 oz.) to a donut (11 grams of sugar per donut). You could eat two donuts instead of guzzling down a glass of GoodBelly. Boy, you’ve been fooled by slick marketing! The main difference, however, is that Coke and donuts aren’t marketed to you as a health food, but GoodBelly is being marketed as good for you! At least when you drink a Coke or down a donut, you know it’s bad for you. You do so at your own volition; but with GoodBelly, you’re thinking you’re ingesting something awesome for your health, and indeed you are not! Since this is a gluten-free blog, I should mention that most GoodBelly drinks are NOT gluten-free. They contain oat flour (not GF oat flour). Some contain barley malt. There are some that are gluten-free (green caps), including Tropical Orange and Cultured Probiotic Coconut Water. Instead of drinking this sugary beverage that will make you fat and feed the bad bacteria in your gut, opt for a probiotic supplement and down the supplement with an 8 oz glass of fresh H2O. If you want something sweet to drink that is full of beneficial bacteria without all the sugar, try kombucha (learn how to make your own kombucha). Also read, 19 So-Called Health Foods that Aren’t Even Healthy and Why Tropicana Probiotic Juices Are Bad For Your Gut and Health.